A large vase full of jewelry! 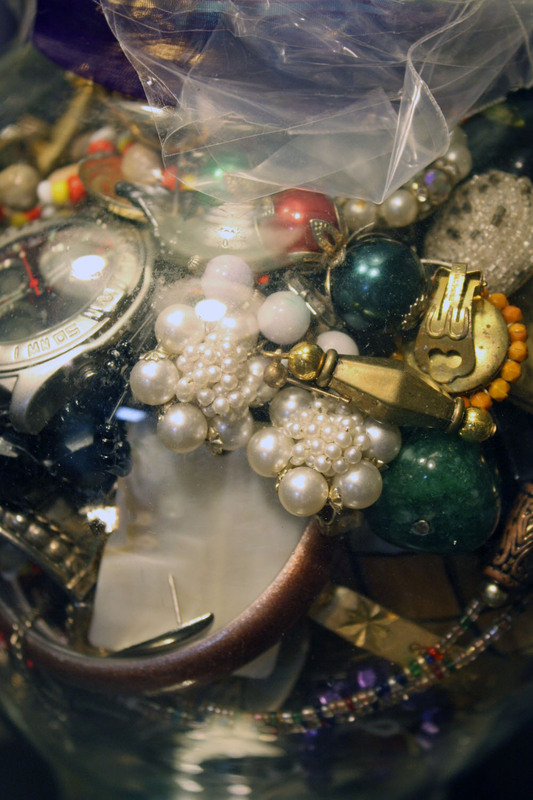 Some of it's broken and some of it is completely wearable as is. 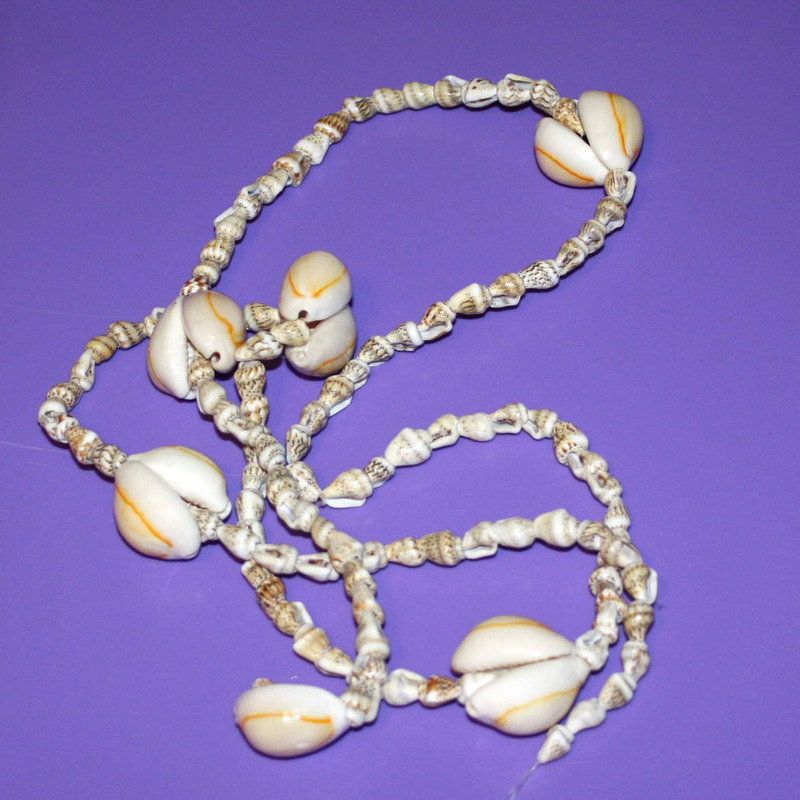 I repurposed some black faceted beads for my Stella and Dot knock off from this stash. 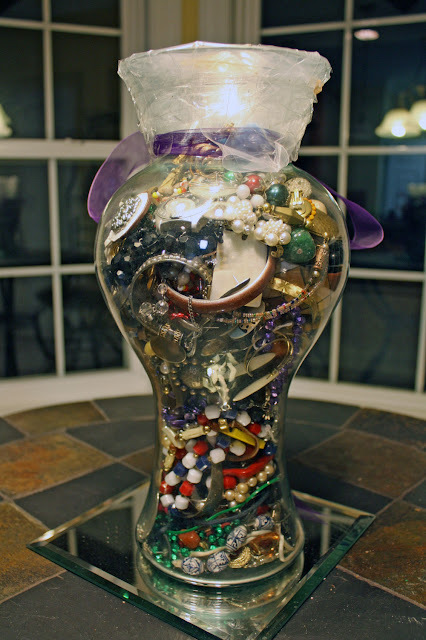 I also intend to make myself a broken jewelry letter like the ones Tip Junkie has featured. I haven't gotten around to that yet, but I do have a wooden "F" in my stash of other things from a project that was never done and now abandoned, so one day I'll have a cool initial on my craft room door. What I HAVE gotten around to is a broken jewelry cross. I picked up a wooden cross at Michael's for a dollar. I wanted to alter/decorate it some way for Easter decor but didn't really know how when I first bought it. Then this idea came to me.... and I LOVE IT. I first painted the cross white. I glued on jewelry and buttons and then glued it to a piece of cardboard cut to fit my frame and covered with a piece of cardstock. I would have liked to have used fabric but I didn't have any in the stash that was the color I wanted. The frame is a repurpose too. It started life as a green and gold frame. Now with the help of Krylon fusion it is white. I have the cross displayed on my mantel. When all the mantel Easter decor is complete I'll share that too. 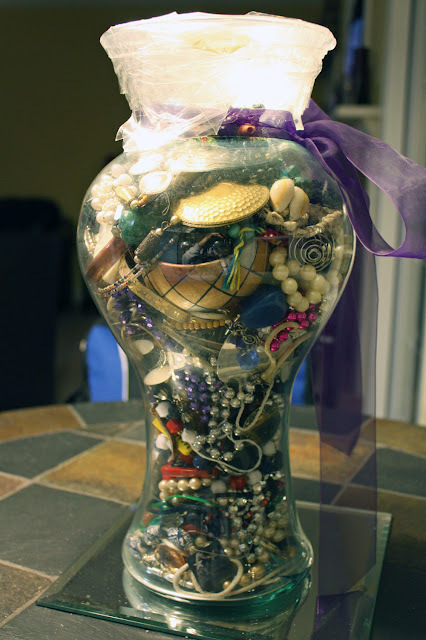 What have you repurposed lately? I'd love to know. This is so cool! I'm trying to find good decor ideas for lent and this is definitely going to be on my to-do list (smaller version though since the frame I have is a little small). 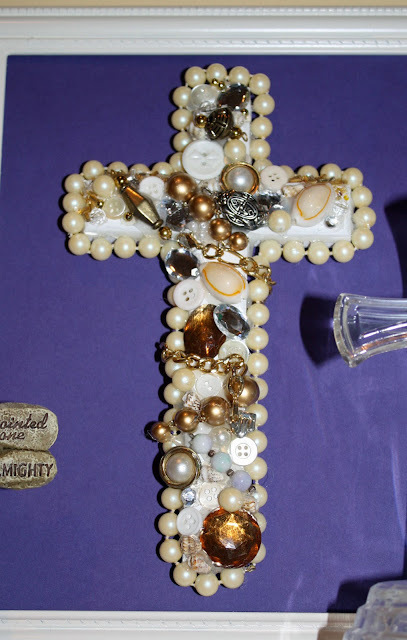 Lucky you with such a fabulous find, and then using them to embellish the cross, fantastic idea! What an amazing find at that shop! 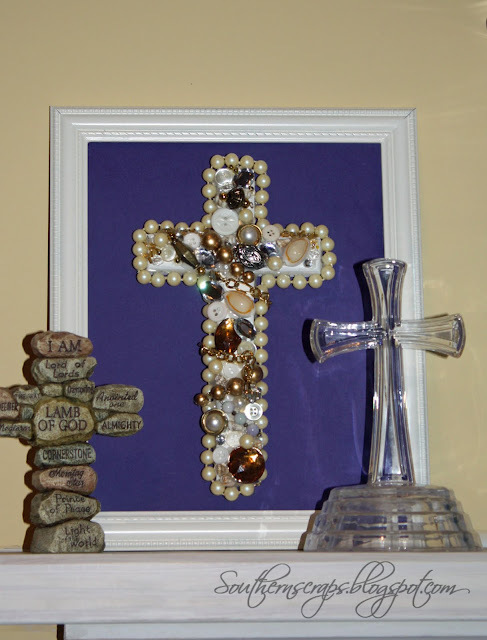 Great use of the items to cover the cross - shiny things reflecting the goodness of Easter. I love that idea!!! 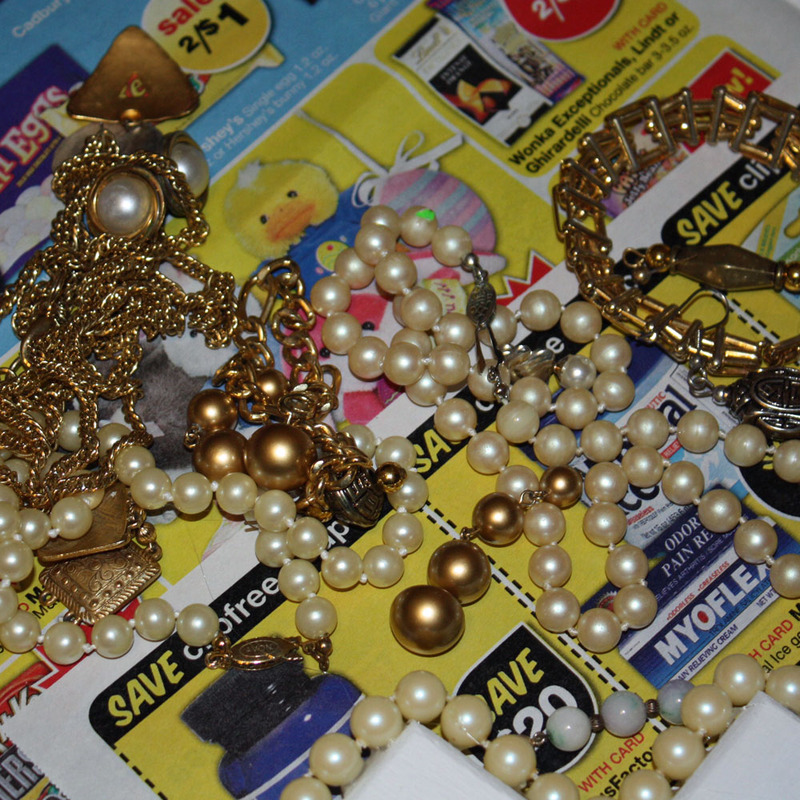 I have lots of cute, sparkly, broken jewelry that I haven't been able to part with. That's a wonderful way to use it. Broken jewelry can be used for all kinds of scrapbook and craft project embellishments. Search yards sales, thrift stores, etsy, and ebay for huge lots of it. This is so lovely! How creative! You have a beautiful blog. Oh, my..that is beautiful! You did such a great job!!! Thanks for sharing this week! I love that cross! I've been wanting to make something special from my grandmother's old costume I hope you'll stop by the Tuesday To Do party and share it! Jamijewelry and this would be perfect. This turned out sooooo beautiful!